The little boy sat patiently waiting as he had for so many nights. This was the special time, soon after the others had gone home, when he and the android would talk. The first time he had been startled. After being still for so long, the boy hadn’t expected any conversation out of the robot. Soon after the first booming “Hello!” though, he had recovered from his surprise and now was quite fond of their time together. He had even become used to the gaping silences between each sentence. However hard he tried, his attempts to start the conversations were never successful. He always had to wait on the tall, looming figure’s halting discourse to start their dialogue, so he leaned against a crate and started to wait. The children were leaving. Although he couldn’t see them he could sense their presence—or absence. One had stayed. One always stayed. The correct response was to acknowledge this one. That’s what his program mandated. His conversational database was limited, but after a few weeks of practice he was adding new information gleaned from the boy. Old programs could be improved upon. He was created to store and use data as his system processed it. Unfortunately, there were many unresponsive pathways in his neural net. His functions had been limited to speaking and recording. These, however, he continued to perform if only because he had no other options. Until his circuits decayed he would run as his working programs directed. “How are you today?” He always started out this way. It was easier to store new variations on old conversations than to vary the conversations and save each one separately. The little boy sat patiently waiting because the android usually took lengthy pauses between his sentences. If the boy didn’t wait he would get ahead of the machine and then they would both become confused. So, since he was young and easily bored, he drew pictures in the sand and threw rocks at the water and generally amused himself while the robot clicked and whirred and prepared its next words. The boy’s name was Herbert and his mother worked long hours. Herbert had a sitter, but she didn’t particularly care what he was doing or where he was as long as he made it home before his mom. He’d only been late once and all hell had broken loose. They’d even called the cops, which Herbert was still young enough to think of as pretty neat. Neither his mother nor the sitter knew about the android. When they asked if he had found a friend, Herbert simply said, “Yes.” That was how he referred to the mechanical man from then on. In Herbert’s head, the android was his friend. The children were leaving and Arthur couldn’t find his mechanical butler. The servant had been a present from his grandson and broke down more often than it performed its appointed duties. Summer was over and they wouldn’t all be back at the beach for another year. Arthur wanted to make sure the butler was properly shut down and stored, but the rest of the family was anxious to leave. The horn of his son’s Jeep sounded impatiently and Arthur sighed. He was becoming absentminded as he aged and no one seemed to want to wait on an old man. He had tried this one before and the android had replied, “What’s in a name?” Herbert had been more than a little put off at that. He thought, perhaps, if he asked a question he had tried before the answer would be easier for the android. It didn’t however, appear to have any effect. Herbert felt let down. Every afternoon when he came home from school he rushed to his room and put on his play clothes so that none of the other children would beat him to the beach. 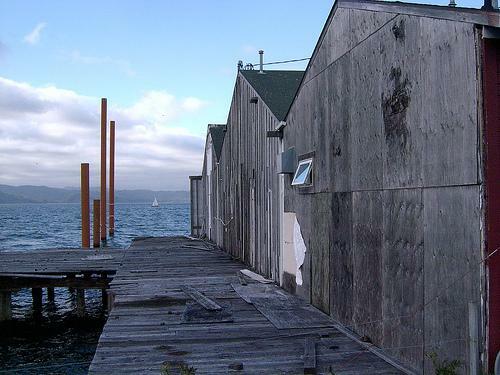 The abandoned warehouse near his home had a dock that reached out into the ocean. All the neighborhood kids would gather there while hunting for skipping stones. The robot was slouched in between two empty crates around back of the warehouse beneath the broken window. The other children had been curious about the android to begin with, but they bored easily and had quickly moved on to jellyfish spearing and other more interesting pastimes. Only Herbert had remained interested and eventually, been rewarded by actually being addressed once the others had gone. Now, it seemed Herbert was going to lose his friend after all. If the robot couldn’t talk any longer, he didn’t have any use for it. He kicked its useless legs, hoping the android would at least say “Ouch!” but there was nothing. The children were leaving. Fewer and fewer of them came back to the beach every year. Their parents and their parents’ parents had been cottagers who would escape from the city for the summer bringing their BMWs and their pets and generally increasing the caliber of bridge nights for the locals they came to call friends. Their numbers, however, were dwindling. Arthur had argued nearly a week with his son and his son’s wife to keep them from renting in the mountains. He was afraid this would be his last year on the sands. After his wife, Ella, died, the kids had just lost interest in the beach house. They wanted to take ski trips instead. Arthur couldn’t rally blame them. As the mean age of the summertime residents rose, there were fewer diversions for children and teenagers because most of the people still flocking to the shore were elderly. So, of course, the kids begged to be taken somewhere else and their numbers decreased even further when their parents gave in, sending them to camps and weekends away. Most of the children left were locals who lived at the beach year-round. Arthur wondered if they were lonely, remembering the friends he had made here when he was just a boy. There had been girls, of course; well, a girl. Cindy had been the best of the locals. She didn’t laugh at his accent and he had never kissed on the first date. She had been a great gal, but in the end she married another local. Arthur sighed as he sat in the back seat of the Jeep watching the small, white cottages and ocean shoreline slowly slip away. He was going to miss this place. The little boy sat patiently waiting at the window as his mother pulled into the drive. As Herbert’s mother walked up to the house, he put down his bowl and spoon and went to the door. The android was forgotten for the moment, a glitch in an otherwise normal day. His thoughts were easily distracted and Herbert’s mind was currently preoccupied with the bags and boxes he had noticed his mother pulling from the back seat of her car. There wasn’t much room in his anticipation for continued disappointment. After the android had refused to talk, Herbert decided to walk home and watch television instead. The other children had left already and there wasn’t a reason to stay on the beach. He didn’t really want to go. It was just the best alternative on a list of not so good ones. His sitter had looked up from her book when he walked in and said, “You’re early.” Herbert stuck his tongue out at her and she shrugged and returned to her reading. They had a mutual policy of ignoring each other and any other exchange tended to be antagonistic. After a solid hour of watching TV, Herbert fixed himself a bowl of Cocoa Puffs and took up his post at the window. His mother wasn’t due back any time soon, but he liked watching the seagulls and neighborhood dogs. They took his mind off the android. He wasn’t so young that he didn’t know robots could break down. On the other hand, he was young enough to be upset at the mechanical man for something that was clearly not the android’s fault. The children were leaving. Arthur sat in his overstuffed brown leather chair back in his state-side home waiting for them to unload the last of the luggage. At this point he just wanted to be alone and away from the over-solicitous pats and agreeable nods of his son’s family. In a few more minutes they would be gone. As he waited, Arthur considered the problem of supper, deciding turkey on rye would probably be better than ham. He was already missing his mechanical butler and wishing the children had given him time to at least find and shut the robot down properly. Arthur sighed as much at the thought that he might never get back to the beach again as he did in exasperation at his son’s wife’s hovering. The grandchildren brought in the last suitcase. There were hugs, kisses, and waves and they were finally gone. Arthur sat where he was for a time and then rose and walked over to the bookshelves. From the top right hand corner he pulled down a dusty green journal, tattered around the edges. He took it back to his chair and opened the cover. An ancient piece of sea grass fell into his lap and he carefully placed it back between the first two pages. Arthur began to carefully thumb through the yellowed leaves. Every now and then he paused, a small smile on his face brought on by a fond memory sparked by something he read. He didn’t linger over anything for too long, however. Arthur was searching for something specific; a number written hastily, long ago, liked with tears and promises. When he found it, he pulled a sticky note and pen from the table beside him and carefully copied it over. The he shut the old diary and went to make his sandwich. The little boy sat patiently waiting on his mother to kiss him goodnight. He had turned off his light and crawled under the bedcovers. It had been a long, disappointing day. There was nothing in the parcels his mother had brought home worth mentioning and his anger at the android had resurfaced after dinner. When his mother asked him why he was sulking he told her half of the truth. He said a friend had let him down. It occurred to him that if he gave her the specifics she would want to find the owner of the robot and return it. The android might not be talking at the moment, but Herbert wasn’t ready to lose the only thing important to him that he didn’t have to share with anyone. It was his android friend and, anyway, telling his mother also seemed somehow disloyal. “I know it’s a bit sudden, but I think you’ll like the change. There will be lots of other children in our apartment building and you’ll get to go to the movies and visit the zoo. You’ll see; it’ll be great!” Herbert’s mother looked at him waiting on a reaction. There wasn’t much of one. He looked like she had just hit him with a hammer. Herbert lay back on his pillows and his mother tucked the sheets in around him. She kissed his forehead and left, turning out the light again. As she closed the door, Herbert heard the phone ring. He thought it was odd at such a late hour, but quickly dismissed it as he turned over his mother’s news in his head and drifted into sleep. The children were leaving. The little boy sat patiently waiting in the moving van while the last of his friends waved from her new bicycle and disappeared around the corner. Herbert hadn’t visited the android in days. He had been back once or twice since the robot stopped talking. Nothing had changed. The mechanical man sat without moving and Herbert tried everything he could think of to make him respond. There just weren’t any words left in the android. Herbert had kicked him in the head hoping to knock something loose. After that he simply gave up. There were more important things to think about right now. Since his mind had been full of boxes and packing tape for the last few days, it came as a bit of a surprise when his mother walked up to the van dragging the android. “Who would want an android that won’t even talk?” Herbert sulked. “A very nice old man, that’s who!” retorted his mother. She walked around to the back of the vehicle and Herbert could hear her arranging room for the robot. A few clinks and clangs later she slammed the retractable door down and came around to climb into the driver’s seat. “Ready?” she smiled at Herbert. He crossed his arms, staring sullenly out the window. His mother put the truck into gear and slowly pulled out into the street. In the side mirror, Herbert watched the warehouse at the end of the street grow smaller. Soon the ocean was only a thin line, and then—the last time he looked—it was gone. This entry was posted in Issue 11:1 and tagged Fiction, Kimberly Klemm by TC Editors. Bookmark the permalink.